March 26th 1991: Launched at Bruce Shipyard and towed to Norway for fitting out. 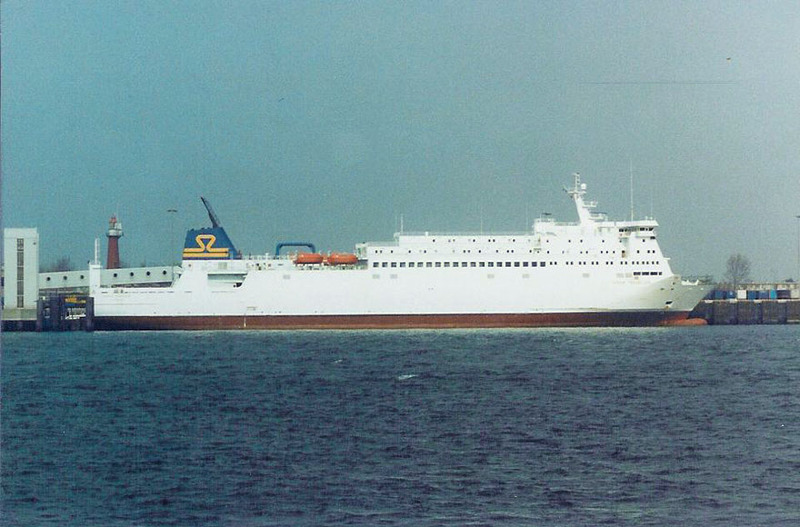 February 1992: Delivered to Stena Rederi Ab, Göteborg. February 29th 1992: Arrived Hook of Holland. 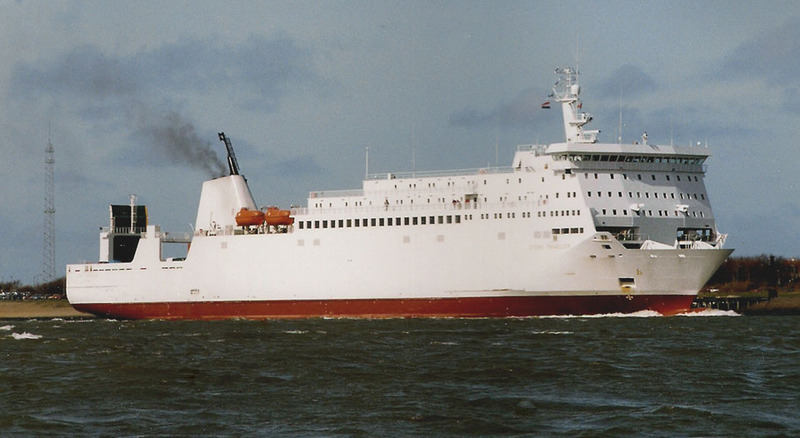 March 1992: Chartered to Tor Line for service between Helsingborg – Immingham. 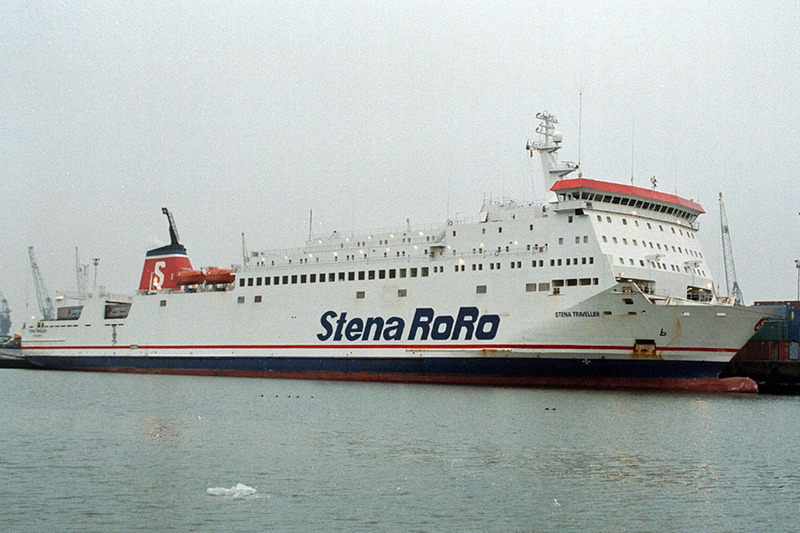 April 1st 1992: Chartered to Stena Line B.V. Holland. 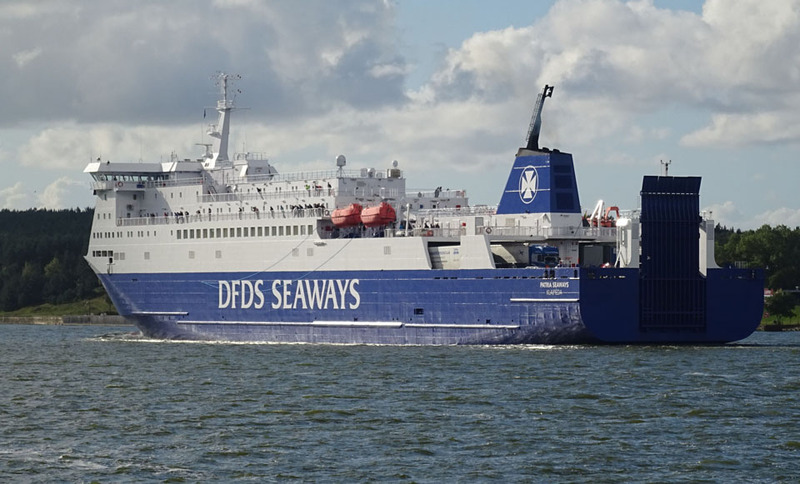 Commenced service as a freight only vessel between Hook of Holland – Harwich. 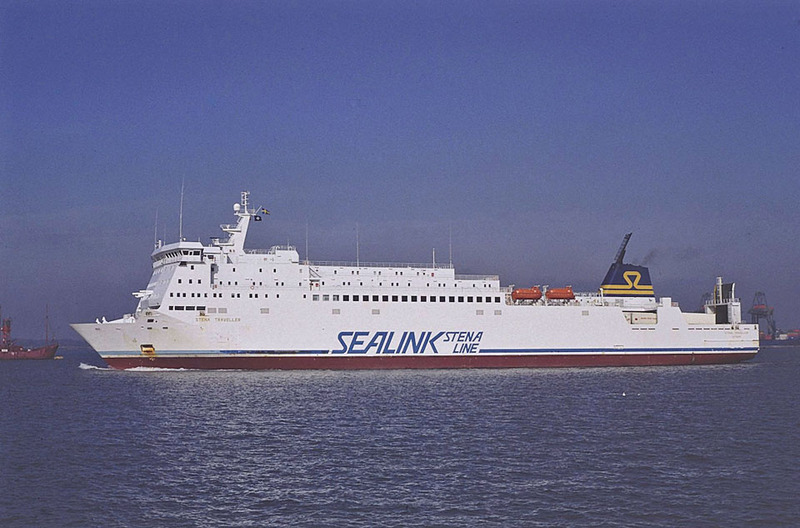 May 1992 – September 16th 1992: Chartered to Sealink Stena Ferries Ltd, Ashford. Operated between Southampton – Cherbourg. September 17th 1992: Chartered to a Turkish company service unknown. 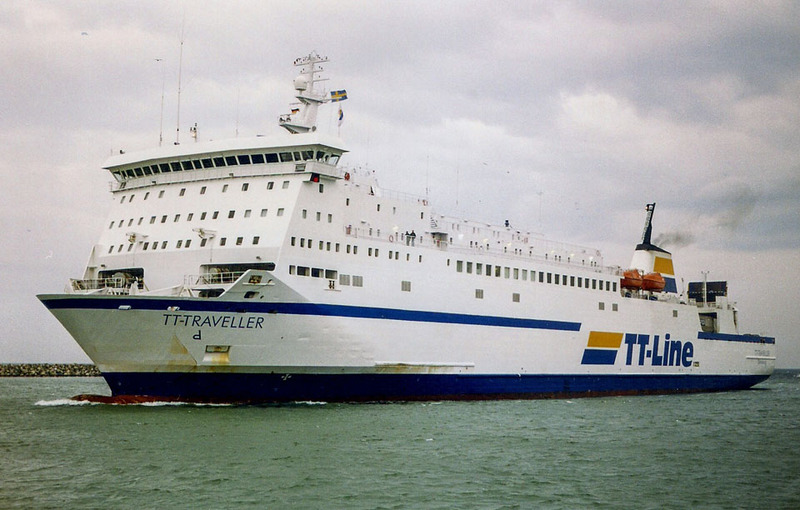 December 5th 1992 – October 29th 1995: Chartered to TT-Line, Germany as a freight only ferry and renamed TT-TRAVELLER. Commenced service between Trelleborg – Travemünde. October 29th 1995: Refitted with Flender Werft AG, Lübeck. November 10th 1995: Completed sea trials after refit. 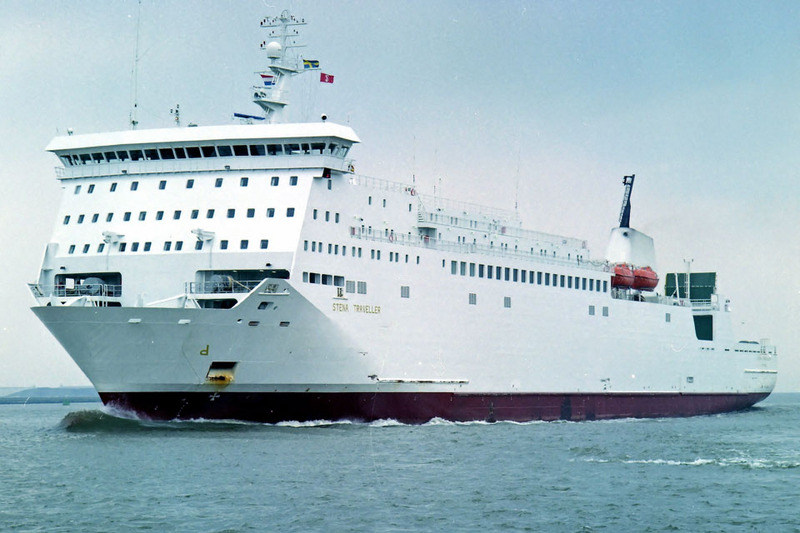 November 11th 1995: Renamed STENA TRAVELLER. November 15th 1995: Arrived in Dublin for berthing trials. November 23rd 1995: Commenced service between Holyhead – Dublin. September 16th 1996: Final day operating between Holyhead – Dublin. 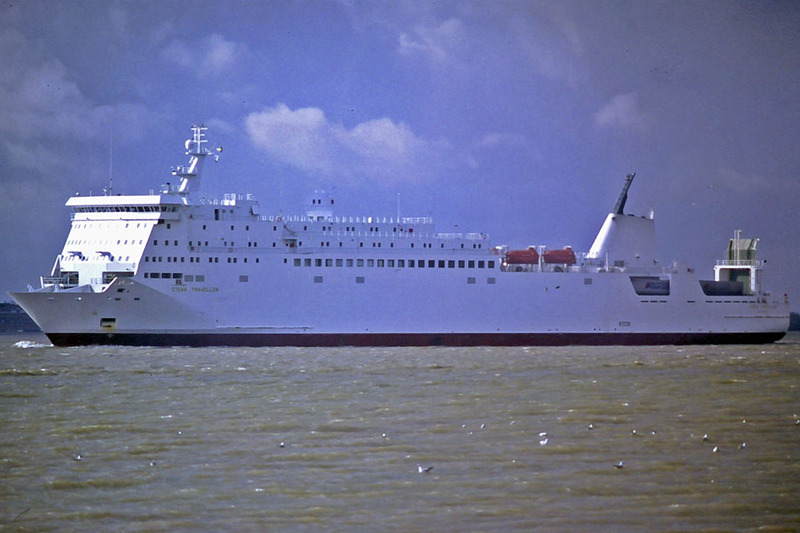 December 1996: Chartered to Grimaldi & Cobelfret. 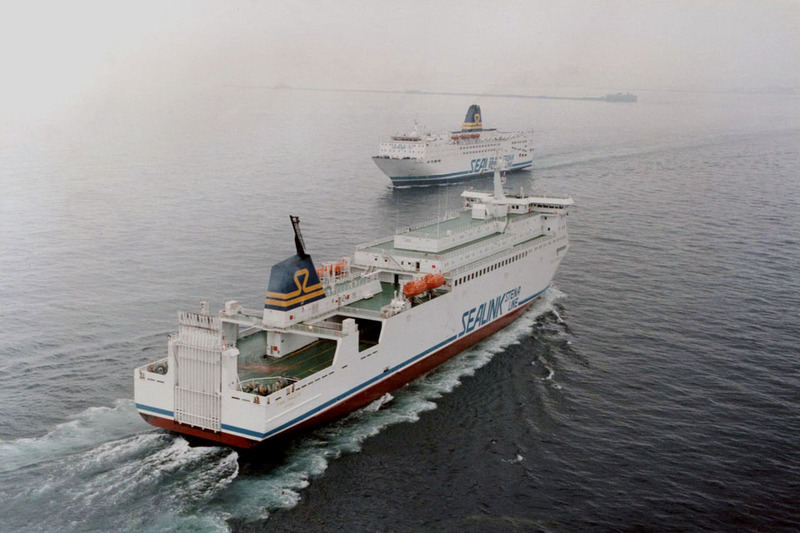 December 1996: Chartered for services between Santander – Harwich. 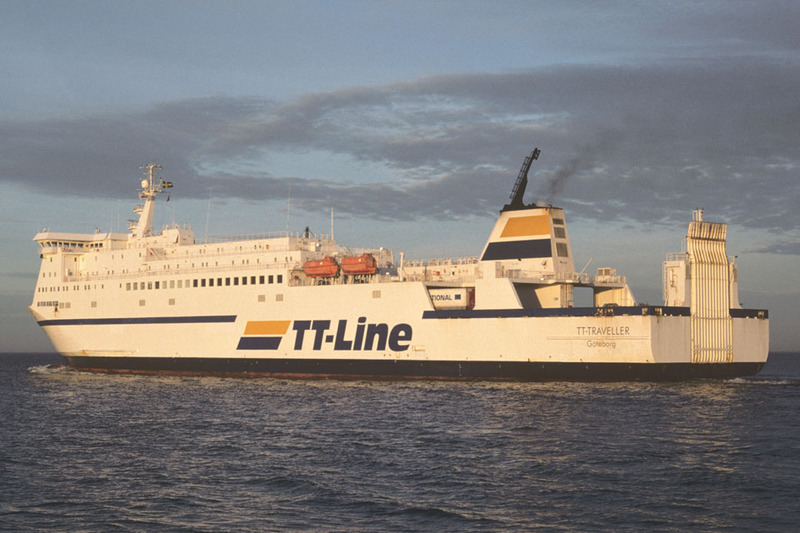 January 1997: Chartered to Tor Line for services between Immingham – Rotterdam. 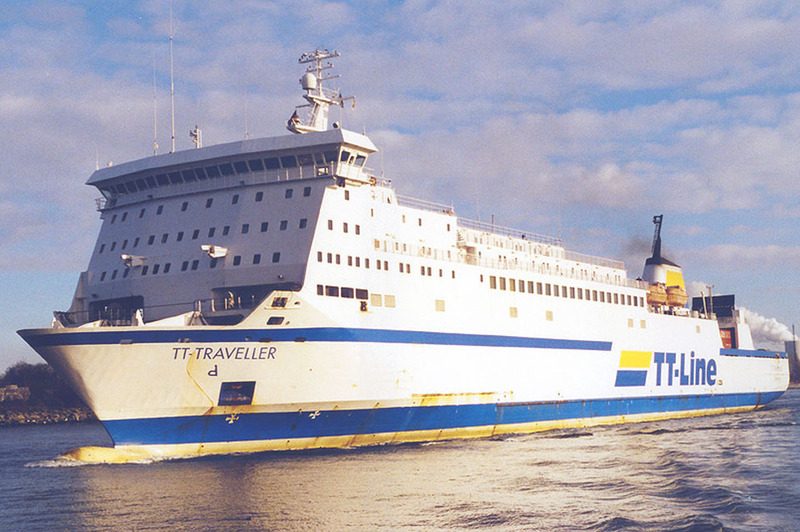 February 1997: Chartered to TT-Line, Germany and renamed TT-TRAVELLER. Transferred to Stena RoRo & Ferry Division, Göteborg. 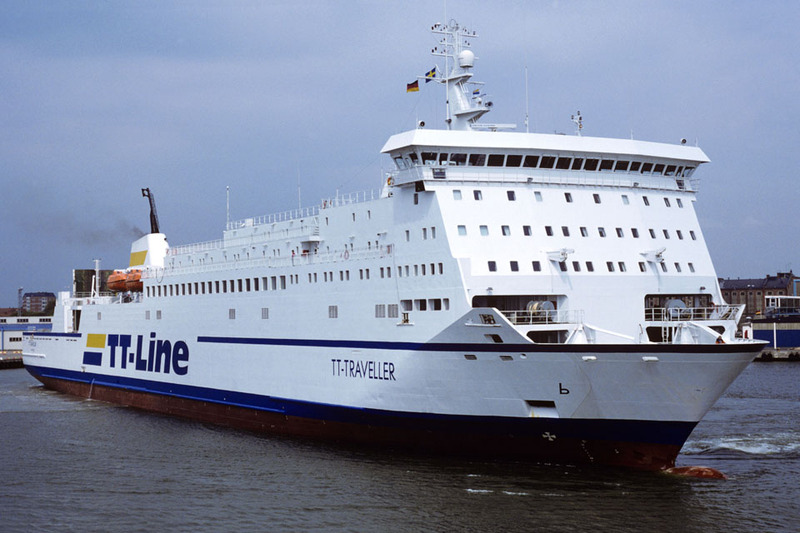 February 11th 1997: Commenced service between Trelleborg – Rostock. 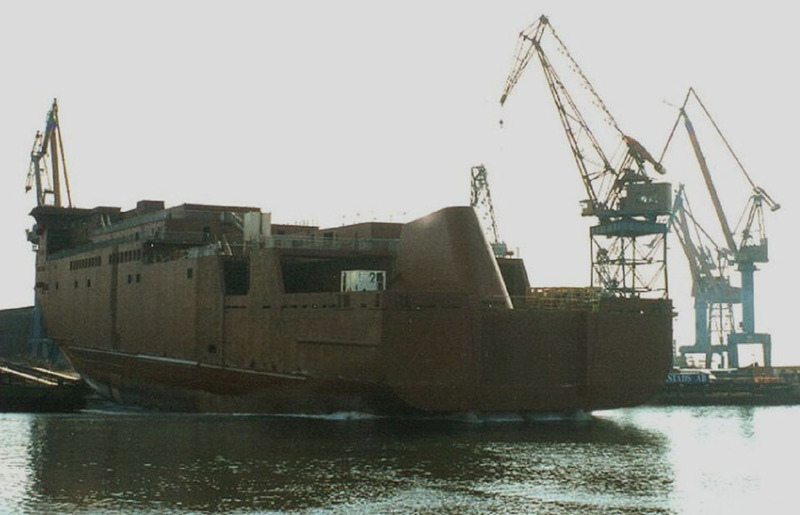 December 1999 – February 2000: Rebuilt at Flender Werft, Lübeck with new cabins and engines parts. January 5th 2002: Arrived again at Flender Werft, Lübeck for overhaul. January 9th 2002: Renamed STENA TRAVELLER. January 14th 2002: Left Lübeck for Karlskrona (Sweden). January 15th 2002: Arrived at Karlskrona. 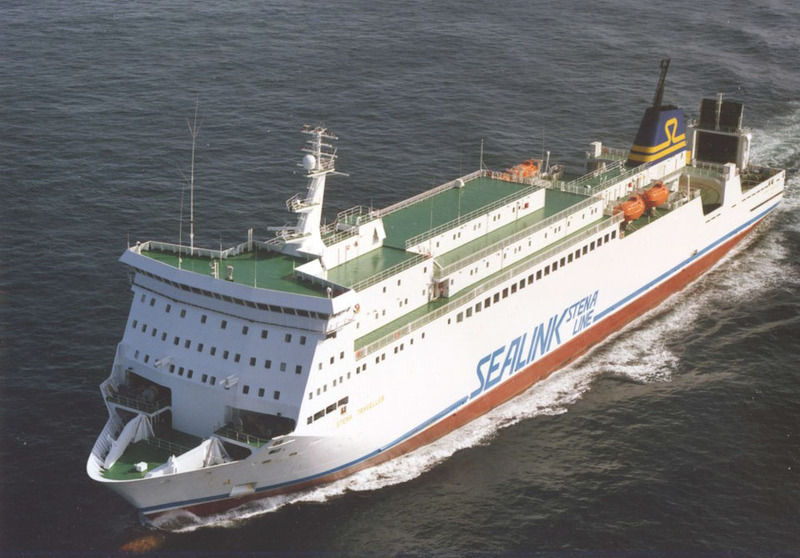 January 20th 2002: Commenced service between Karlskrona – Gdynia (Poland). February 21st 2002: During a journey between Gdynia – Karlskrona excessive roll caused a 30 ton container of asphalt to capsize on her vehicle deck. No damage or injuries. October 9th 2002: En route between Karlskrona – Gdynia suffered engine failure and drifted until she was towed to Karlskrona. 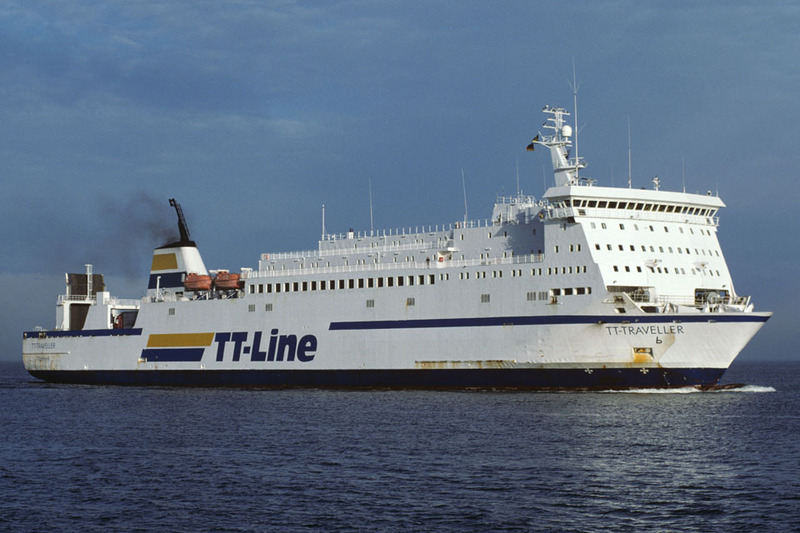 May 6th 2004: Final day in service between Karlskrona – Gdynia. May 10th 2004: Sold to Ab Lisco Baltic Service, Klaipeda, Lithuania (DFDS Tor Line). Renamed LISCO PATRIA. 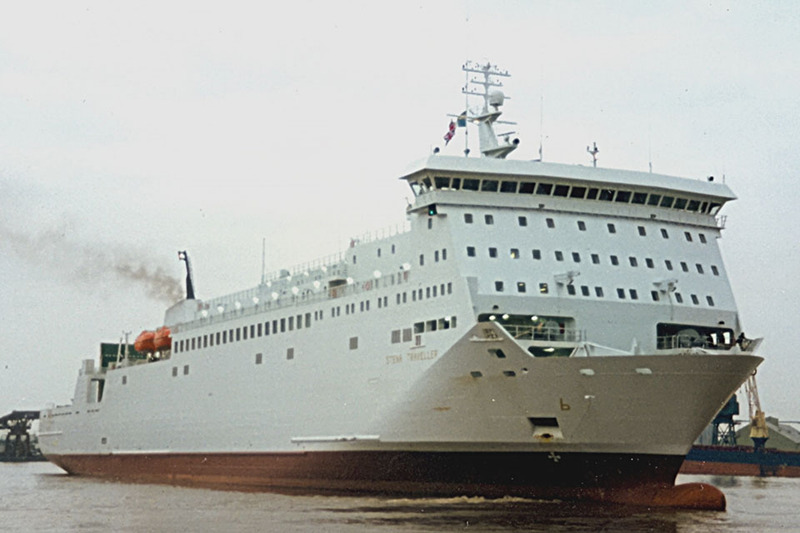 May 17th 2004: Commenced service between Karlshamn – Klaipeda. 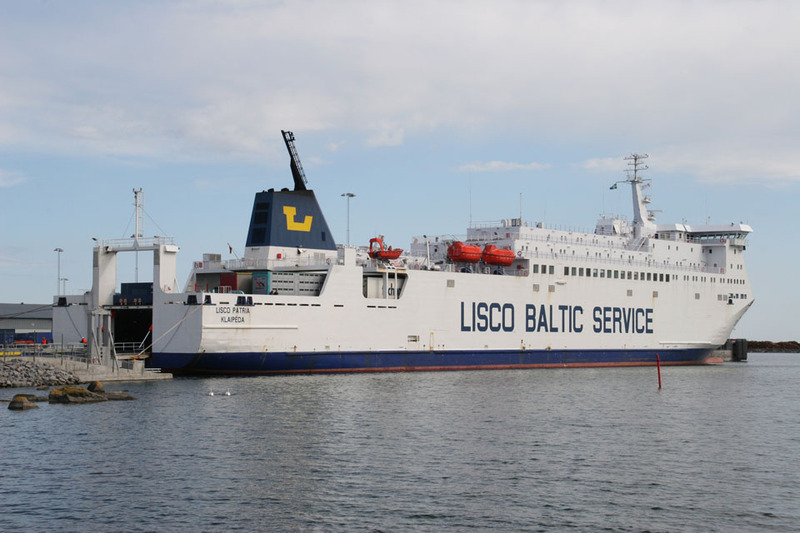 June 10th 2005: Services between Karlshamn – Baltiysk (one trip per week). 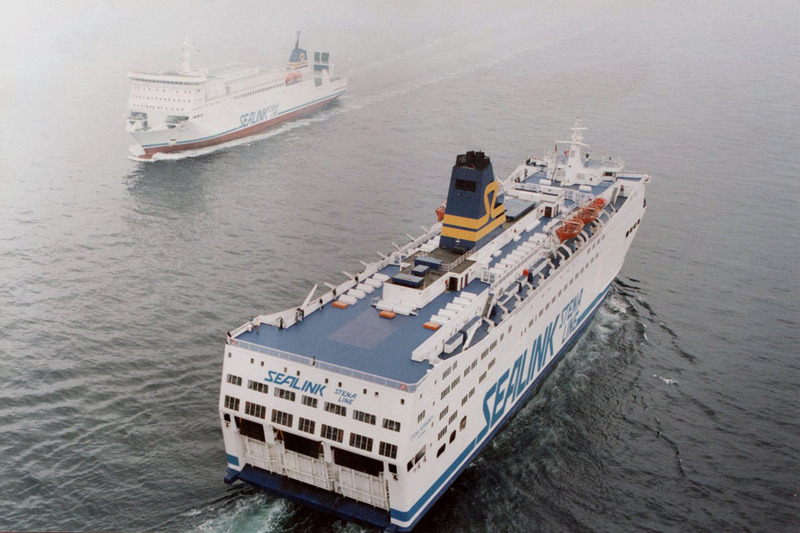 January 6th 2006: Services between Kiel – Klaipeda. 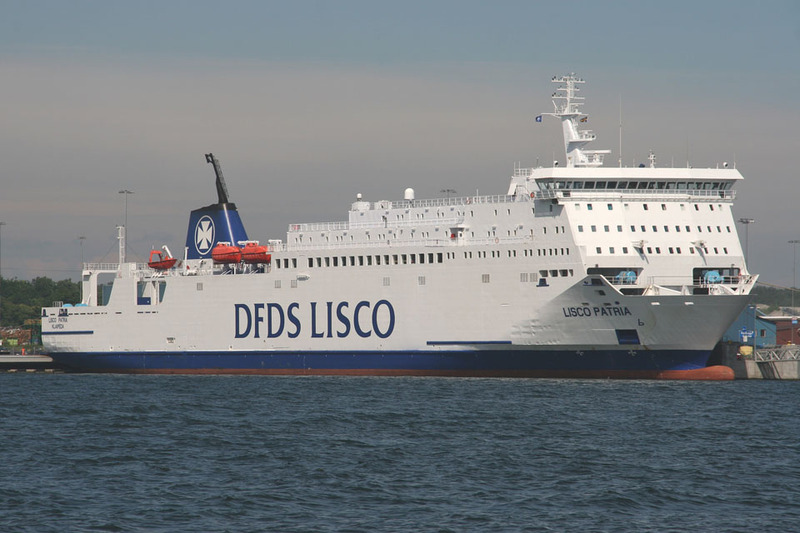 April 27th 2006: Company name change to AB DFDS Lisco. 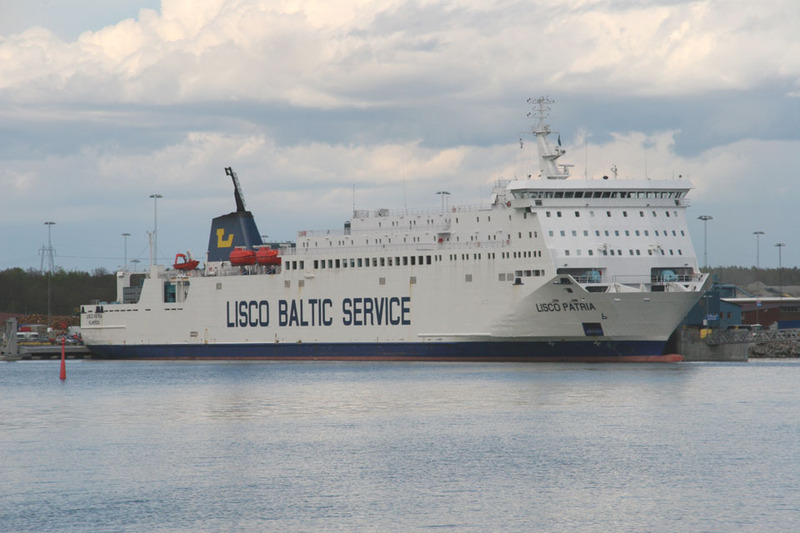 May 2007: Services between Karlshamn – Klaipeda. January 25th 2009 – February 8th 2009: Services between Swinoujscie – Ystad covering WAWEL refit. January 30th 2010 – February 14th 2010: Services between Swinoujscie – Ystad covering WAWEL refit. May 6th 2011: Chartered to Scandinavia Baltic Lines. May 11th 2011: Services between Paldiski – Kapellskär. 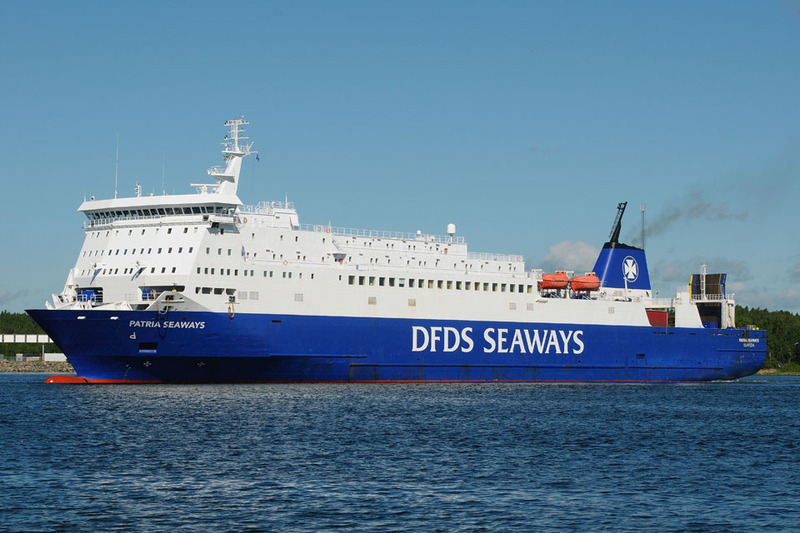 September 14th 2011: DFDS Seaways buys 64% of the company and all services are absorbed by DFDS. December 23rd 2011 – January 13th 2012: Refit in Kopli, Estonia. 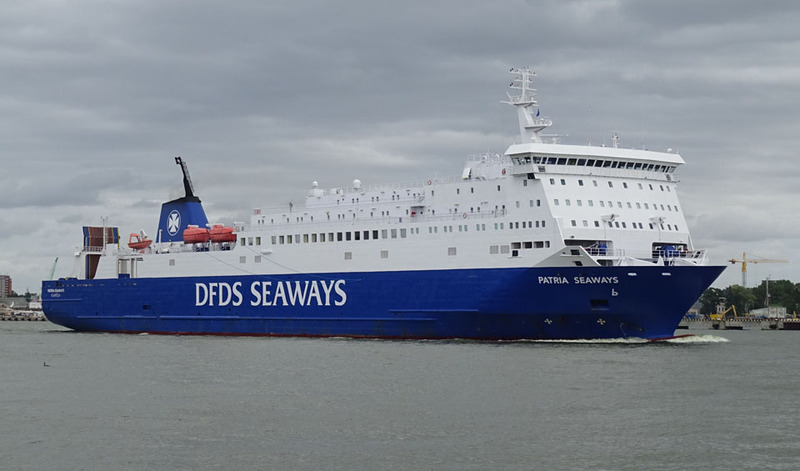 January 5th 2012: Renamed PATRIA SEAWAYS . January 22nd 2012: Services between Paldiski – Kapellskär. October 6th 2014: Final day in service between Kapellskär – Paldiski. October 7th 2014: Laid up in Paldiski. 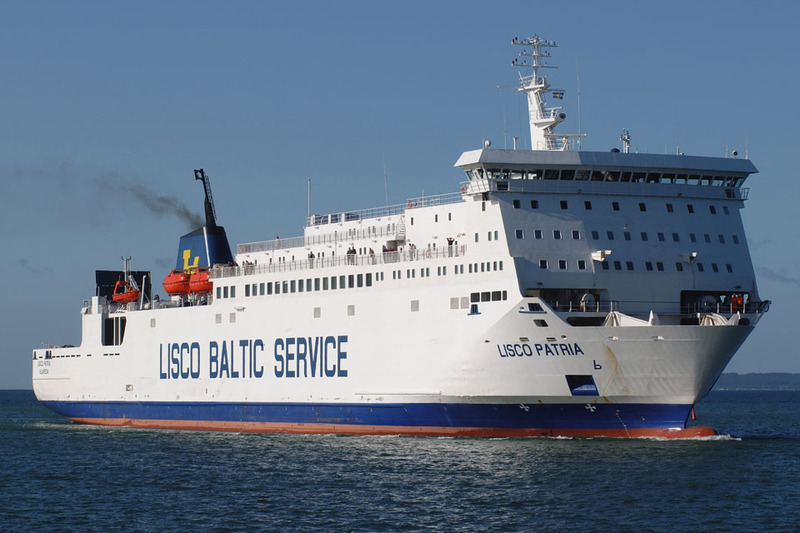 November 4th 2014: Services between Fredericia – Copenhagen – Klaipeda. December 5th 2014: Arrived in Gdansk, for lay up. 2015: Used as a floating hotel for wind energy projects. She sailed to the Danish port of Esbjerg where she was prepared for her new job. This meant, for instance, that a special boat platform was installed on the aft of the vessel so all ships that transport the workers to and from the ‘floating hotel’ could safely berth. May 16th 2015: Anchored about 36 km off the Danish coast for her new job at Butendiek Wind Farms. 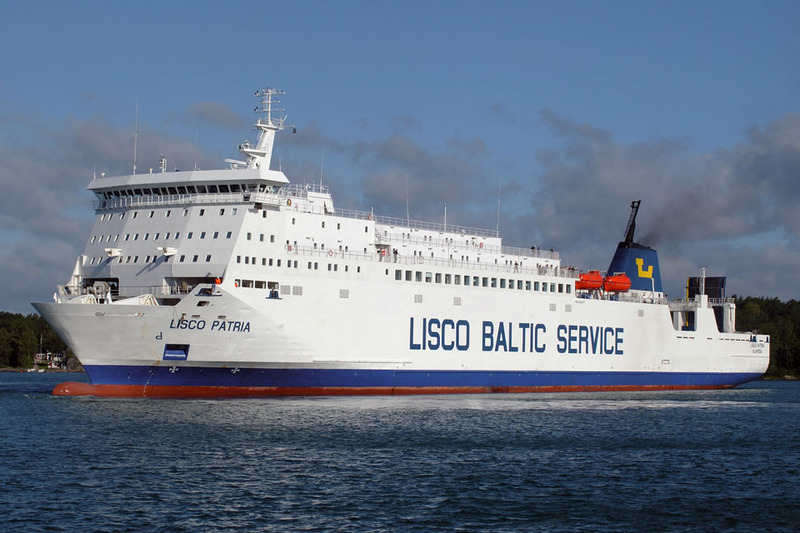 November 16th 2015: Services between Kiel – Klaipeda. December 29th 2015: Chartered to P&O Ferries. 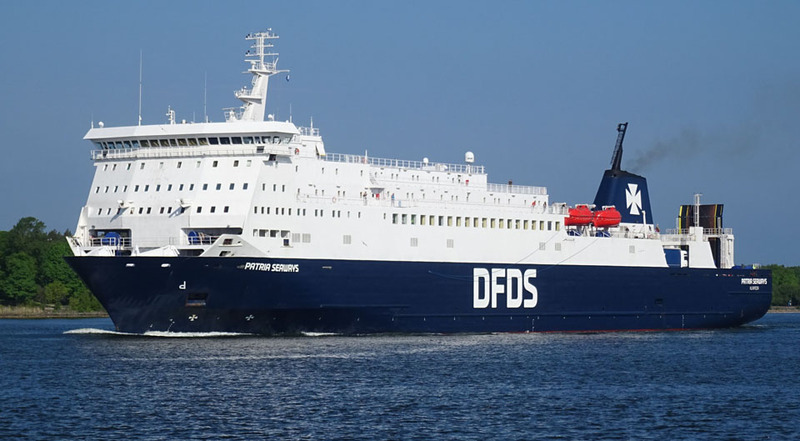 January 4th 2016: Services between Zeebrugge – Hull. April 2016: Services between Karlshamn – Klaipeda. December 2016: Laid up in Klaipeda. January 13th 2017: Left Klaipeda for Paldiski. January 14th 2017 – February 1st 2017: Services between Paldiski – Kapellskär. February 2nd 2017: Services between Klaipeda – Karlshamn. February 19th 2017: Left Klaipeda for Copenhagen. February 2017: One trip per week between Klaipeda – Fredericia. March 4th 2017 – March 25th 2017: Services between Klaipeda – Karlshamn. March 25th 2017: Services between Klaipeda – Karlshamn – Fredericia. January 14th 2018 – February 2018: Chartered to TT Line for services between Trelleborg – Rostock/ Travemünde. All information is believed to be correct and no responsibility is accepted for any errors or omissions found. All items included in this article are subject to © copyright. We would like to take this opportunity of thanking: Gena Amfimov,Tony Garner, Frank Heine, Pieter Inpyn, Wolfgang Kramer, Capt Jan Melchers, Simonwp and Andreas Wörteler for their assistance in compiling this feature.